A group of residents in Camp Liberty, adjacent to Baghdad International Airport and home to more 2,500 Iranian refugee dissidents, held a rally on Wednesday, 14 January 2015 protesting the continuing medical siege on this camp which has to this day taken the lives of more than 23 victims. These protesters hold the United Nations and US government responsible for the status quo. From 2009 the US went back on its moral and legal obligations and handed over the protection of these residents to the Iraqi government. From then onward due to the medical siege imposed on the Iraqi forces loyal to the former prime minster, Nouri al-Maliki – that continue to impose pressure and psychological torture on the residents – the camp residents are under harsh and inhumane conditions. 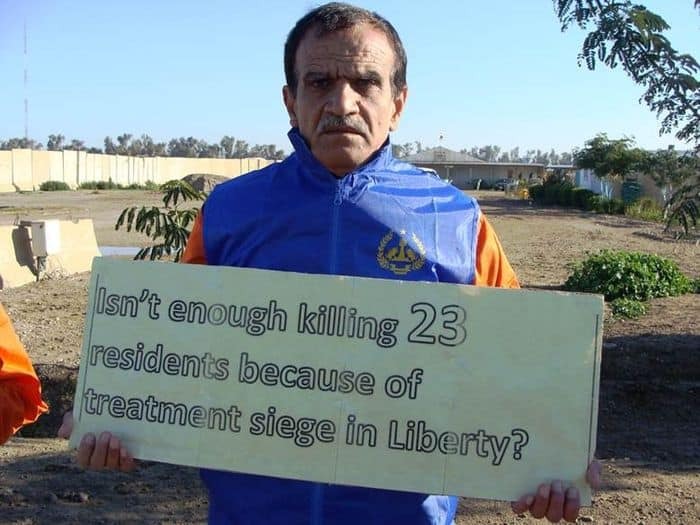 Camp Liberty resident protesting the deaths of 23 residents due to the Iraqi medical siege. Born in 1950, Ms. Mahin Afzali was a senior member of the People’s Mojahedin Organization of Iran with 36 years of resistance experience against the fundamentalist regime ruling Iran. She is the 23rd victim of this blockade. She had been suffering from an illness for a very long time and finally lost her life due to the inhumane medical siege in Camp Liberty. This while Ms. Afzali had a refugee passport in France yet since the French government did not accept her resettlement, her name was registered in many UNHCR lists to be resettled to receive medical treatment in other countries. None of these measures for her transfer outside of Iraq bore results and now, the medical siege and its continuing status against the residents has endangered the lives of the other Camp Liberty patients. The protesters in this rally held Ms. Afazali’s picture in their hands and also posters saying the result of the medical siege and UN-US silence on the status of Camp Liberty have resulted in Ms. Afzali losing her life in Camp Liberty. The participants in this gathering called on the UN and Iraqi government to lift the inhumane medical siege and the UNHCR to recognize the residents’ refugee rights. “Today we are gathered here to raise our voice against these circumstances in Camp Liberty and the all-out siege enforced on us,” Nader says. 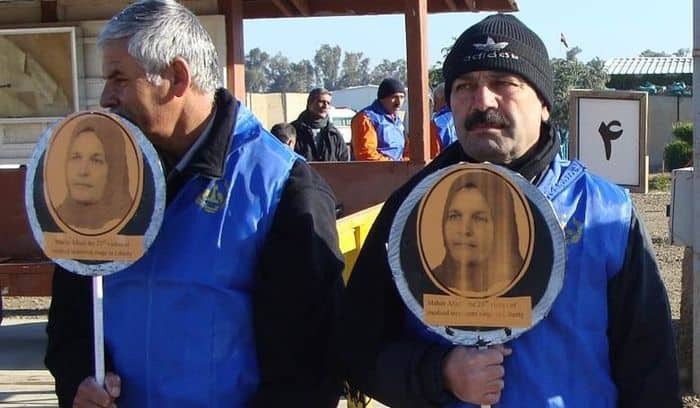 An Iranian Dissident in Camp Liberty holds a poster of Ms. Mahin Afzali, the 23rd victim of Iraq’s medical siege. “Unfortunately, inaction seen from UNAMI and the US government – who are responsible regarding our conditions – have allowed these pressures to continue on the camp and the patients in this camp are suffering from their illnesses due to the continuing medical siege,” he added. When this rally was held, UNAMI representatives were inside the camp, passing by the protesters in two SUVs without giving any answers to those who were in deep despair after the loss of a dear friend. They just left the camp without paying any attention to the protesters.